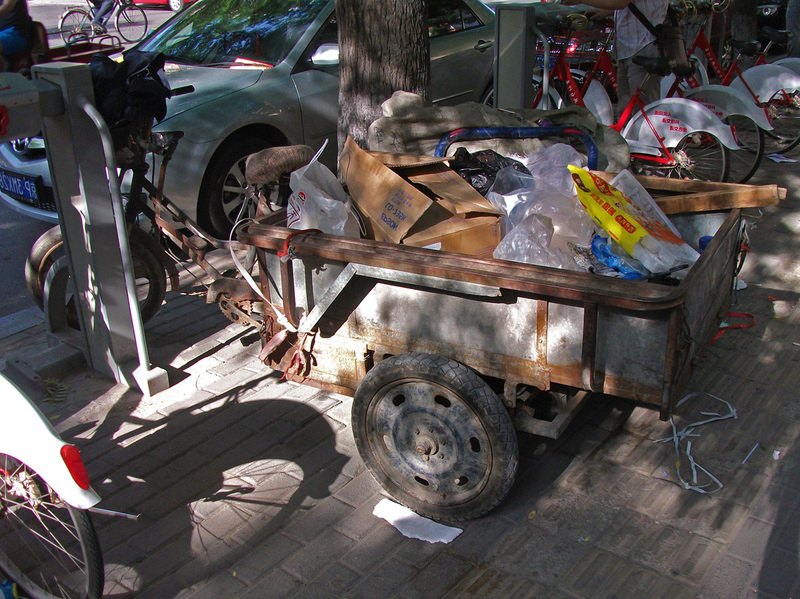 There are lots of reasons why people visit Beijing, despite the terrible pollution even though I was there during one of the better weeks. 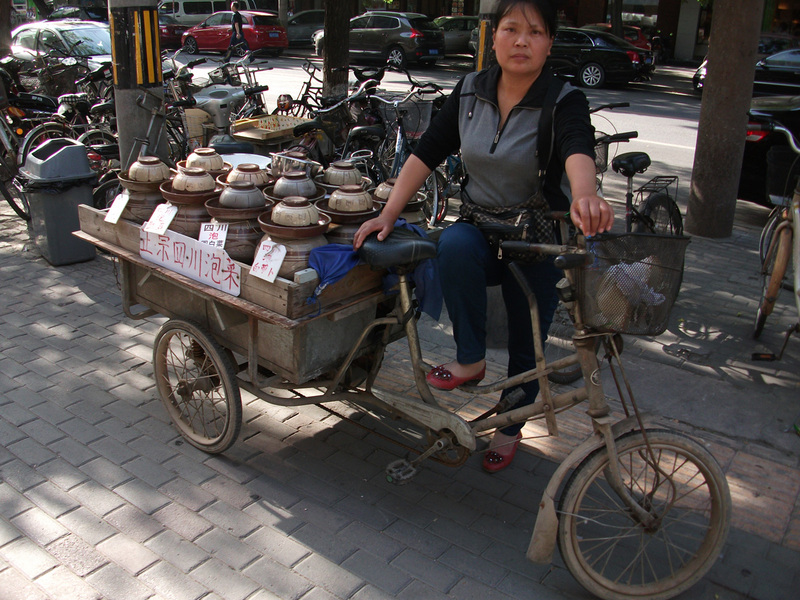 There is lots of ordinary food, but also lots of great food, as well as the more exotic: snake, fried scorpions and silkworms. There is the great wall only a couple of hours away from the centre of the city, if you catch it on a clear day quite spectacular, not so great on an overcast day. 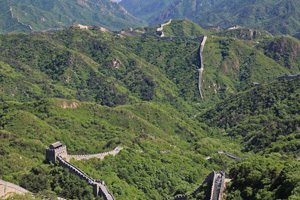 The tours to the great wall unfortunately end up dropping you among thousands of other tourists and include the inevitable visit to their favourite jade and silk factories. 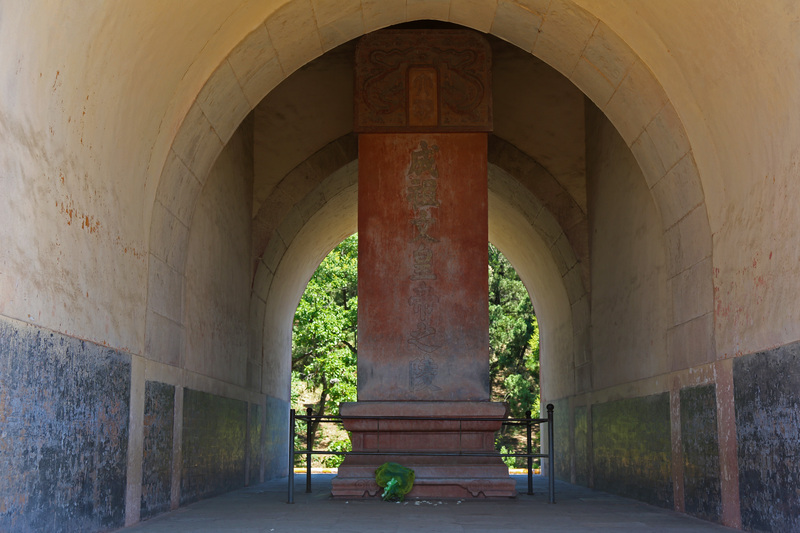 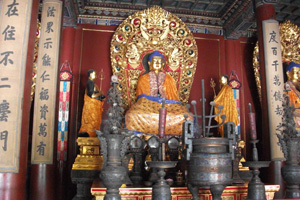 The forbidden city as well as many of the central temples are lovely but rather ruined due to the tourist numbers. It's pretty easy to get around by train, the stops have English text as do the short trip ticket machines, only 2 Yuan for most trips. Taxis are also quite cheap although if you look like a tourist with bags then be prepared to be quoted rip-off prices, insist on using the meter. 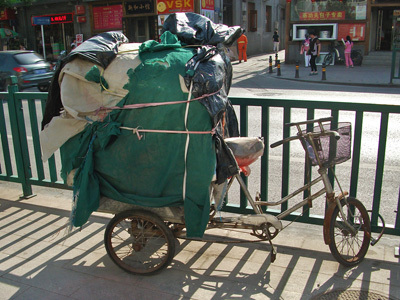 As a rule the drivers will speak no English so come prepared with your accommodation written in Mandarin as well as your destination. 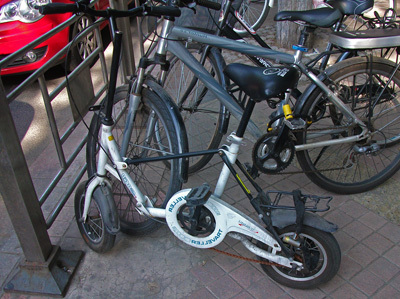 As with most cities in the region, tourist shops will try to charge you whatever they think they can get away with. 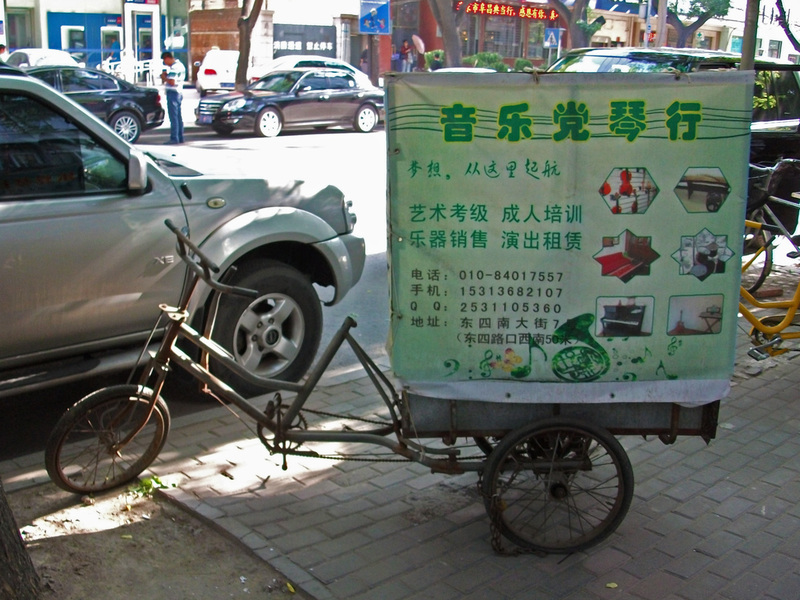 Feel free to bargain aggressively especially for things you know there are hundreds of other shops selling the same thing, walking away from a store once negotiations have stalled can do wonders. ... then there are the bikes, a wonderful selection not normally found from where I come from. 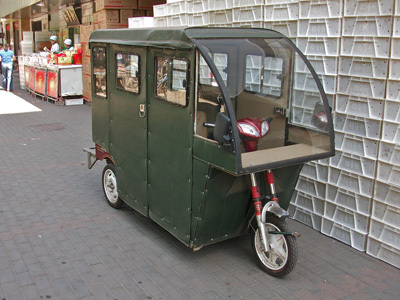 Most are battery powered so they sneak up behind you and ring their bell at the last minute. 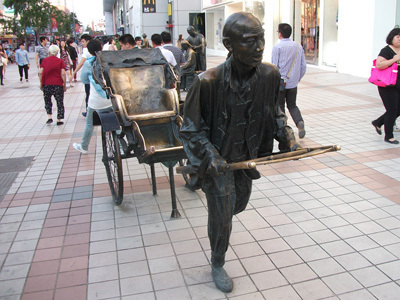 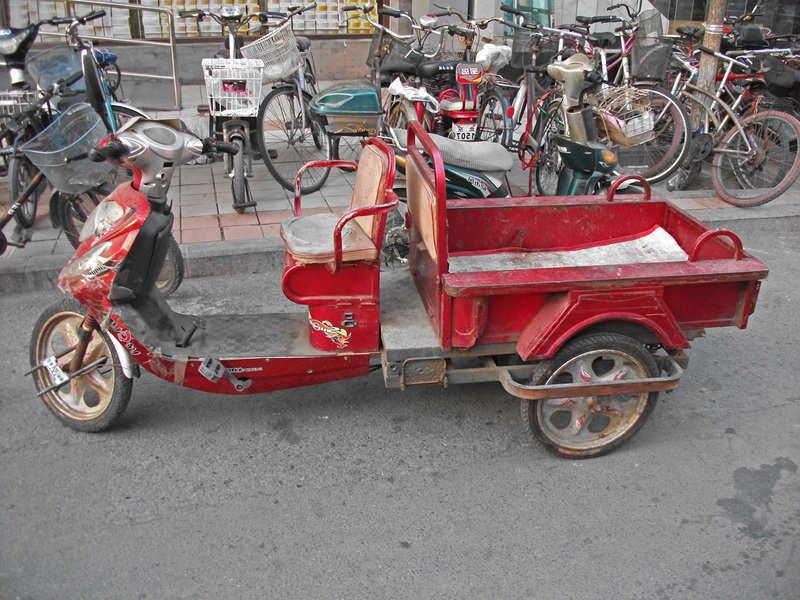 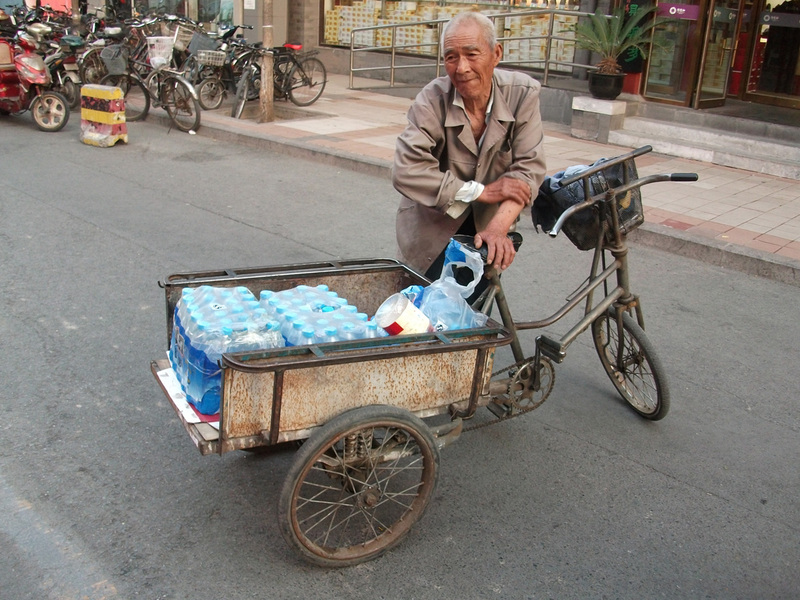 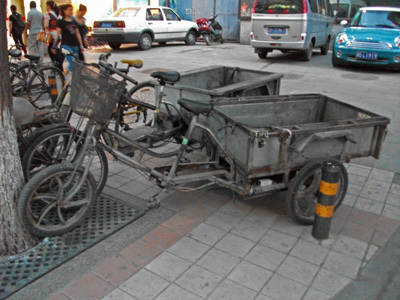 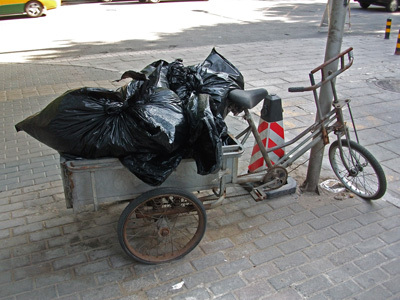 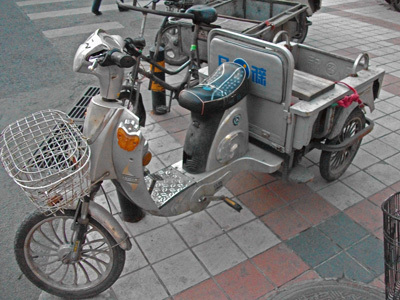 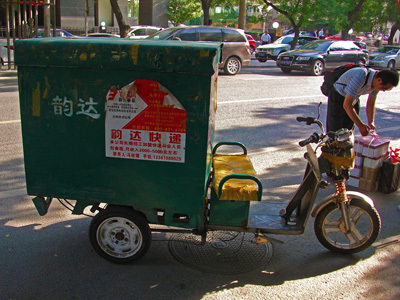 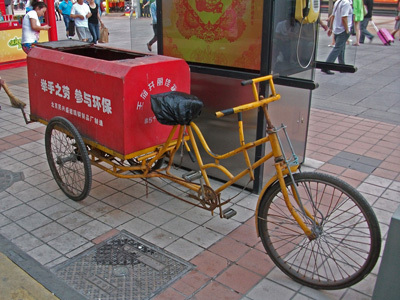 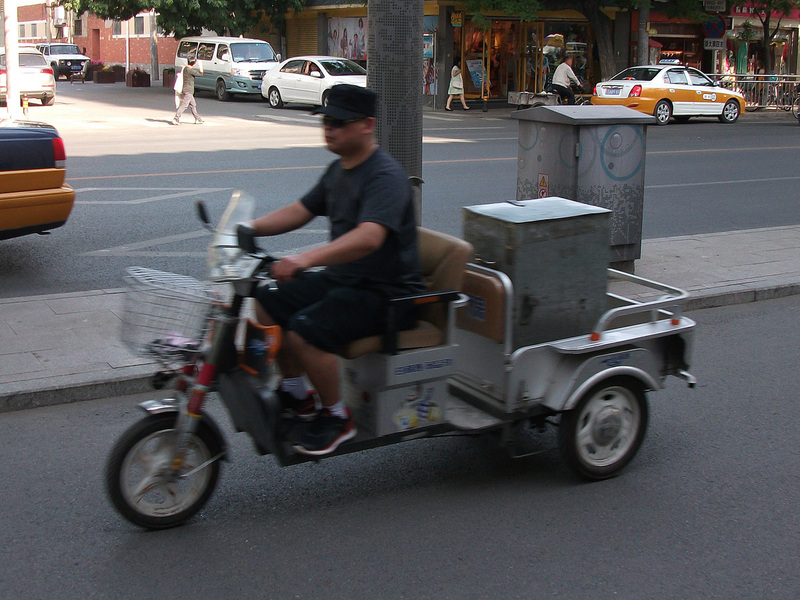 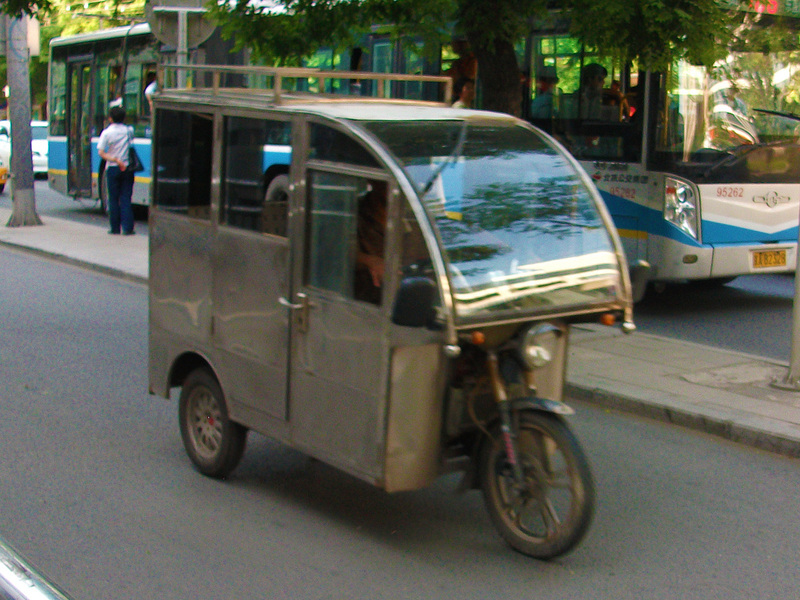 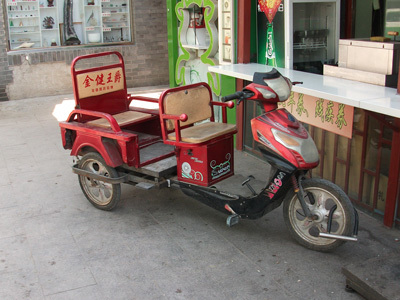 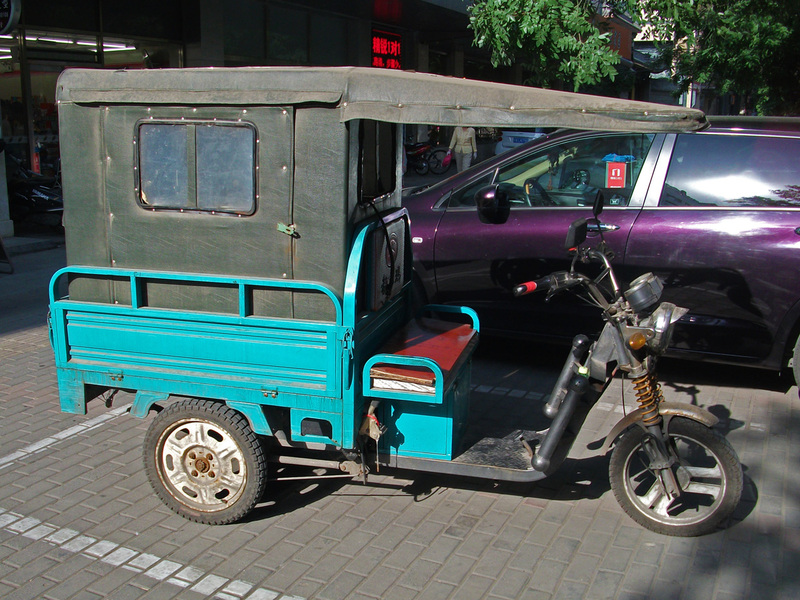 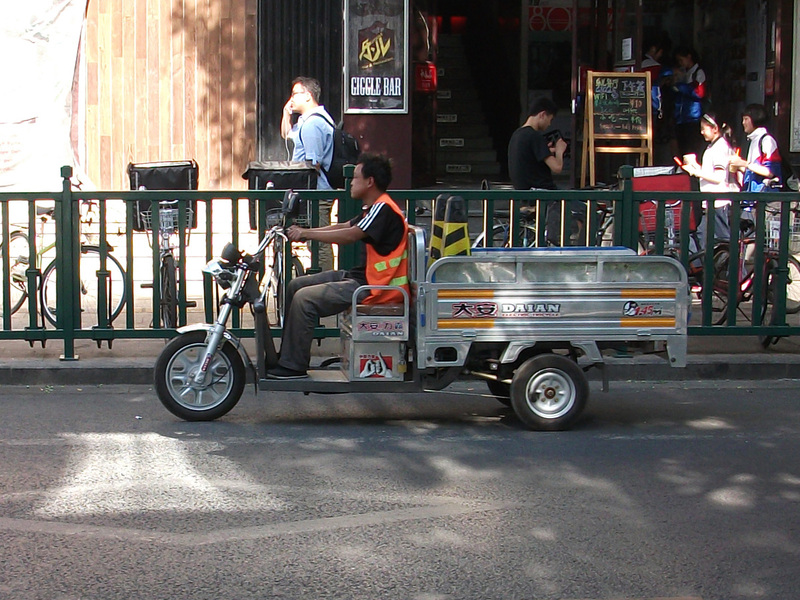 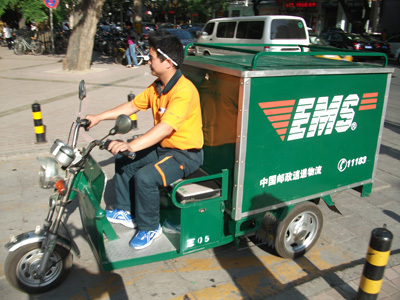 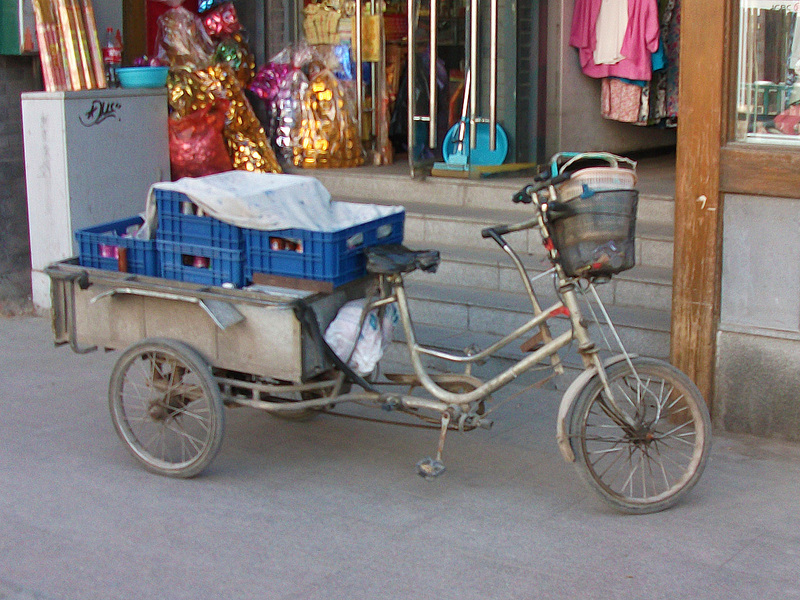 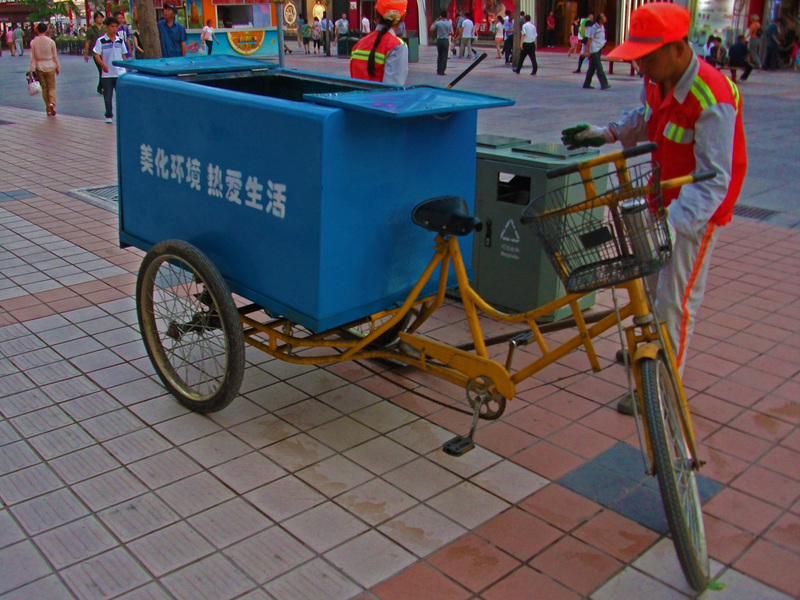 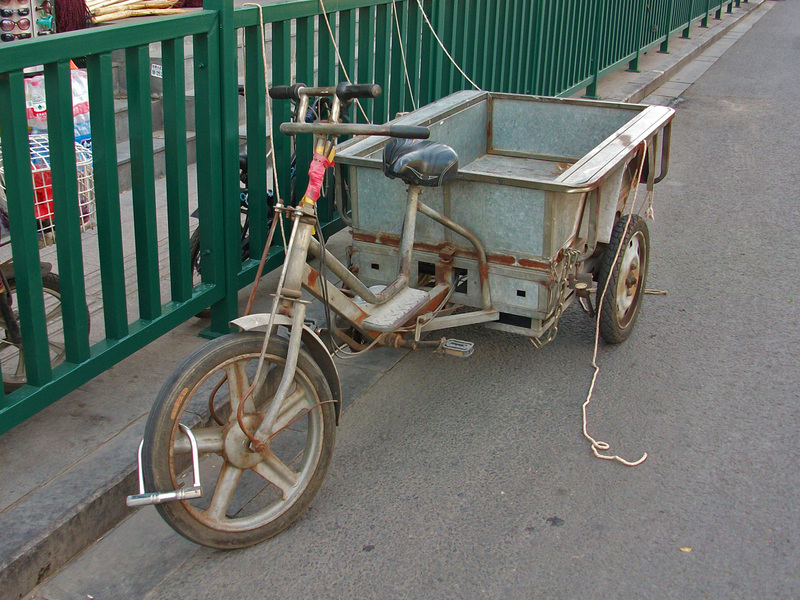 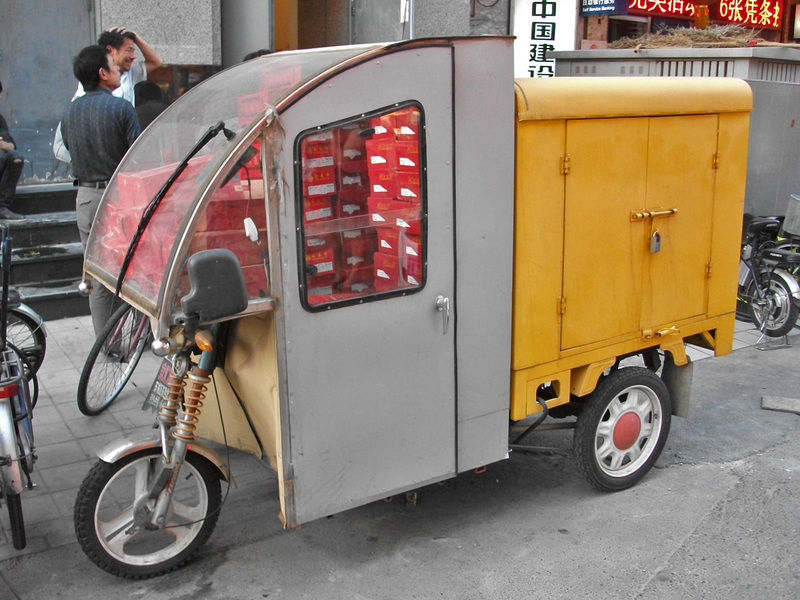 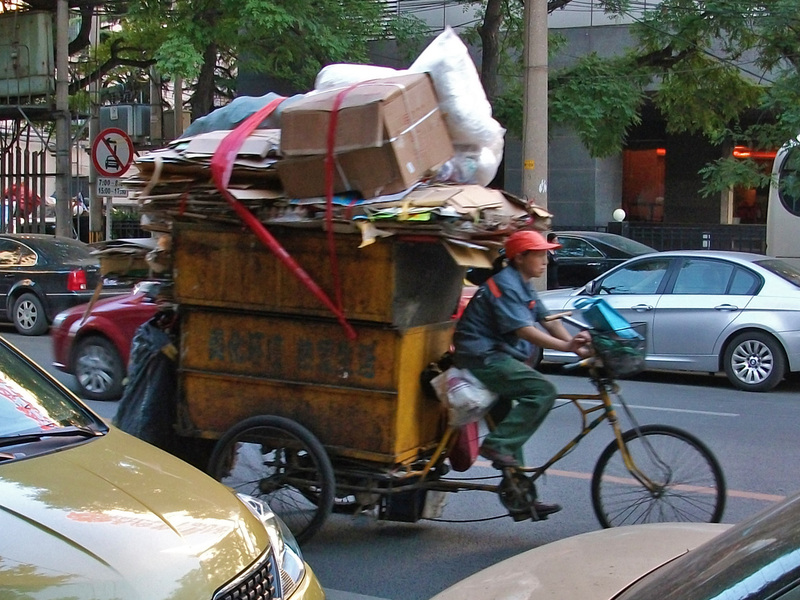 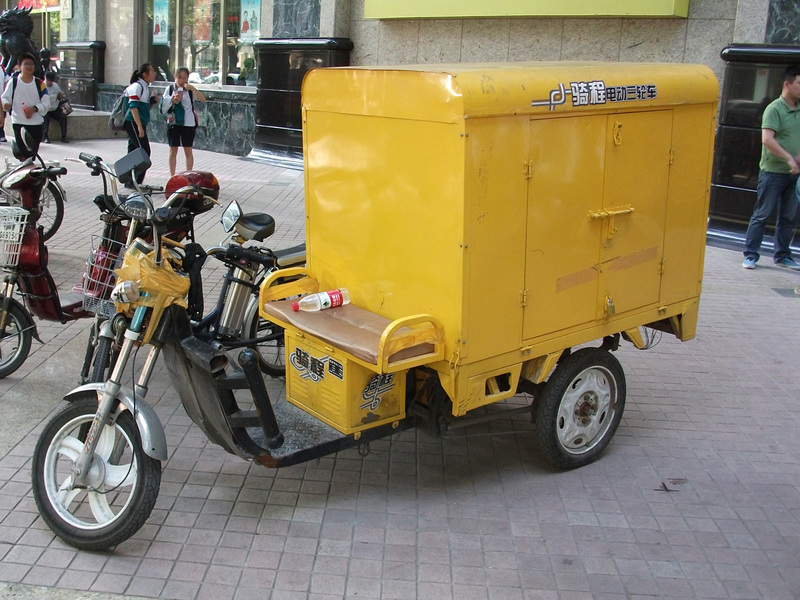 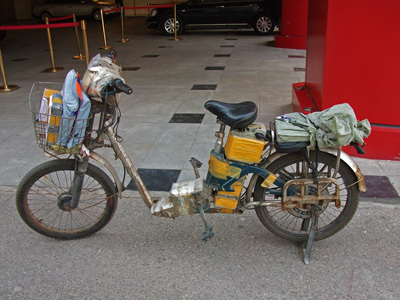 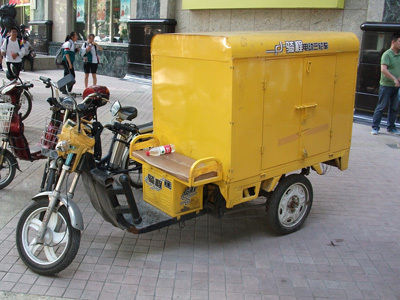 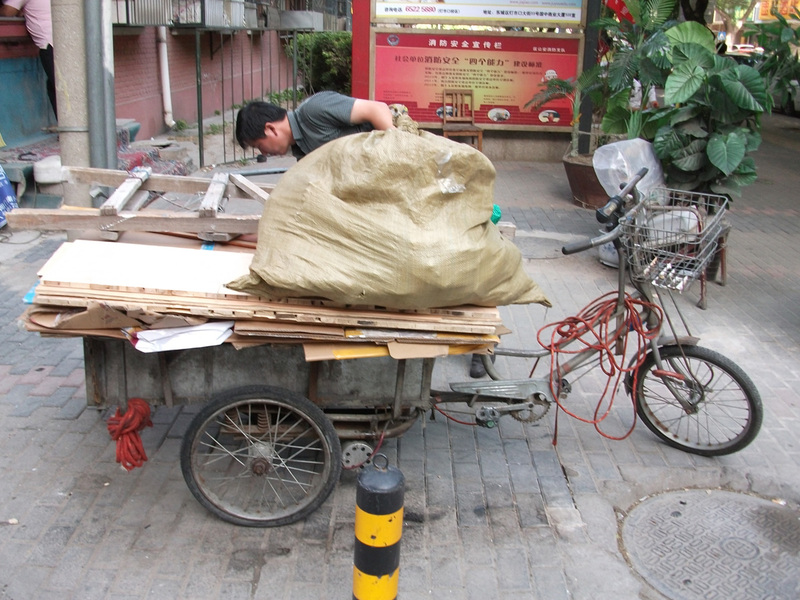 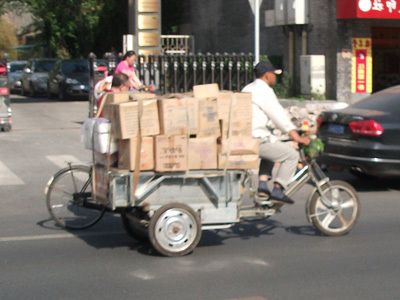 The three wheelers are used for everything from taxis, couriers, stores to rubbish trucks. 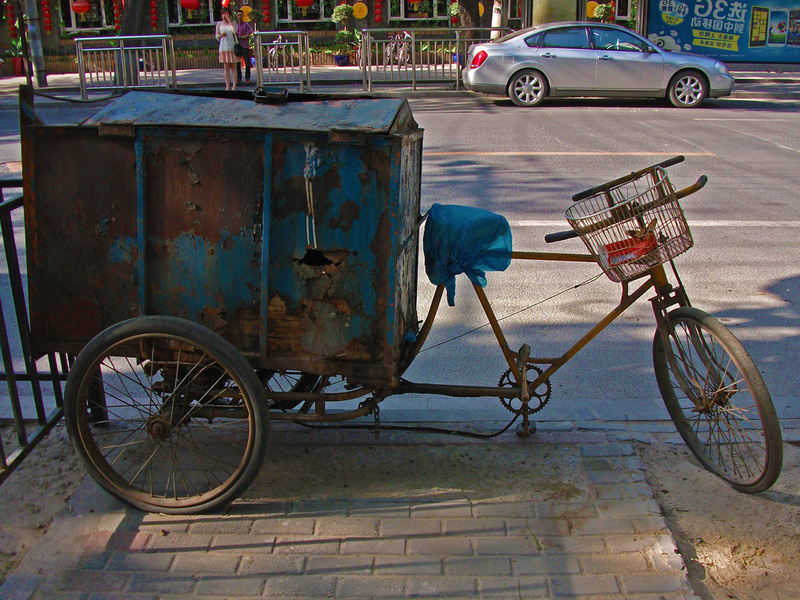 On my last day I become someone obsessed with this aspect of the city, the gallery below is the result (and I needed something to do in the plane!). 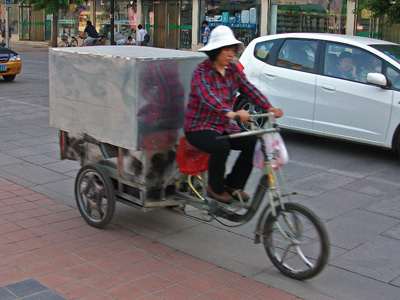 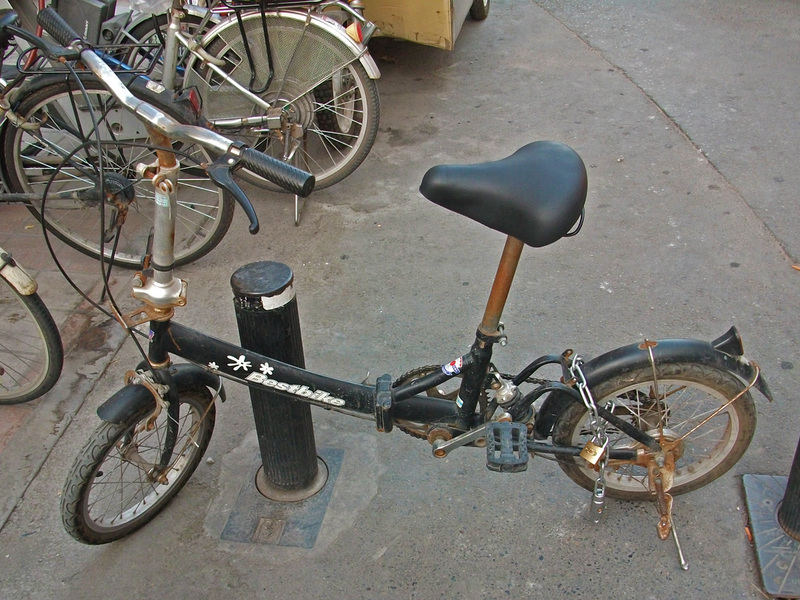 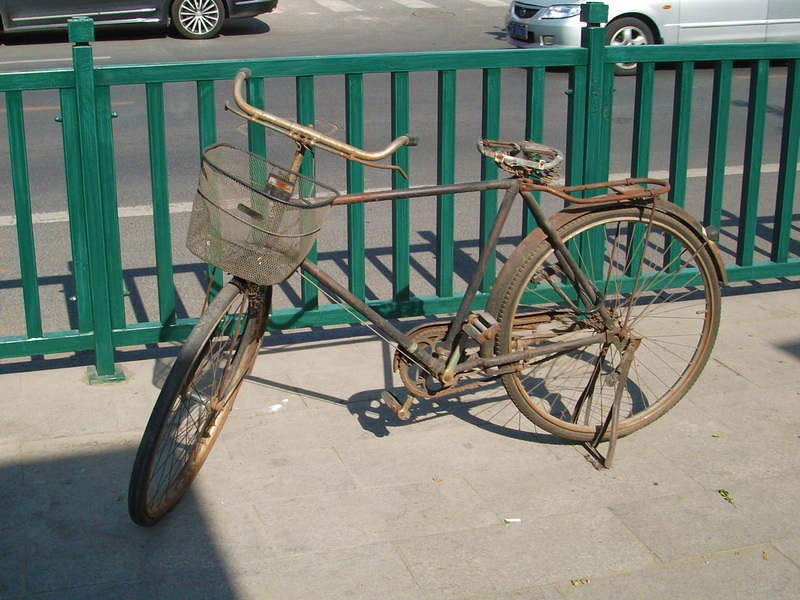 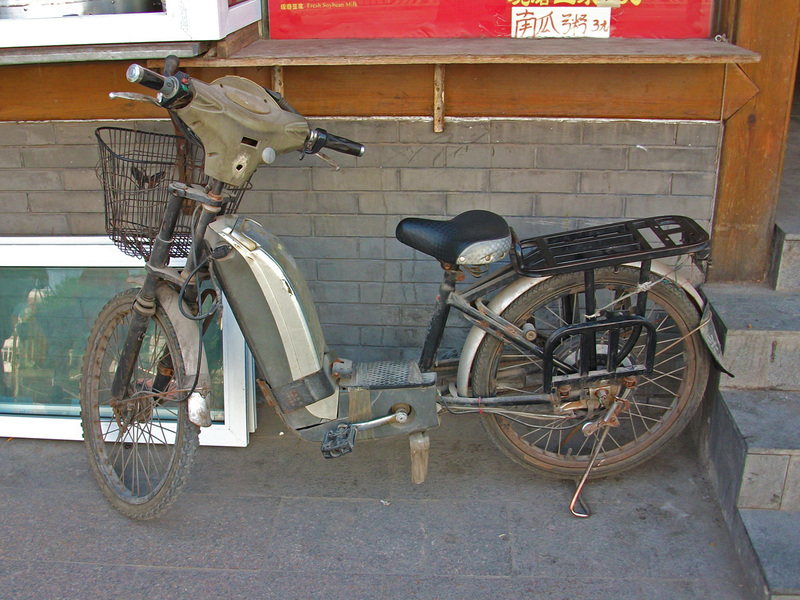 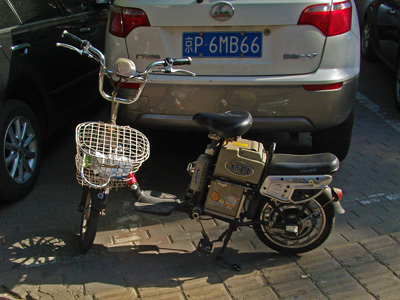 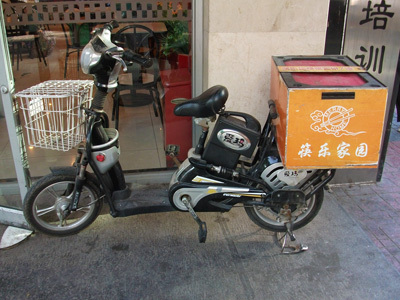 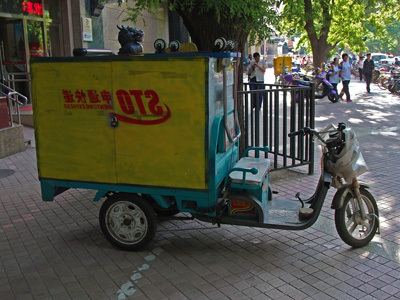 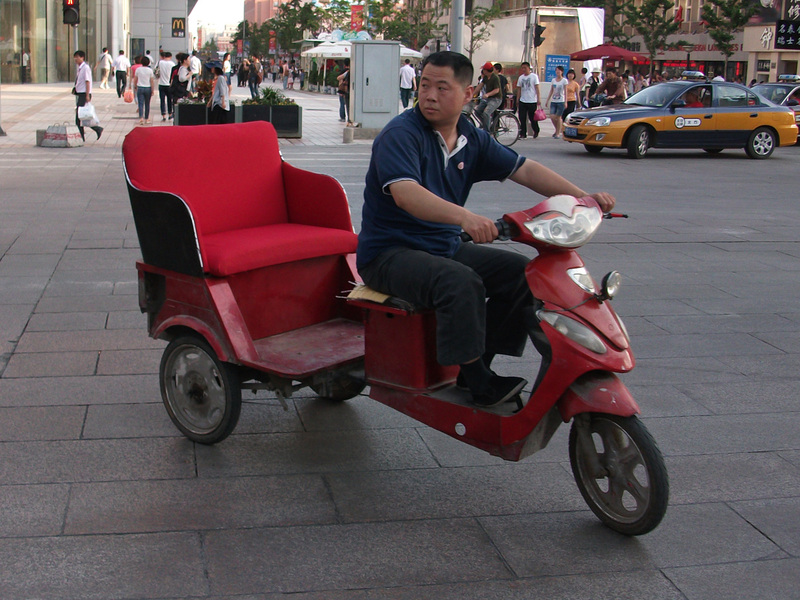 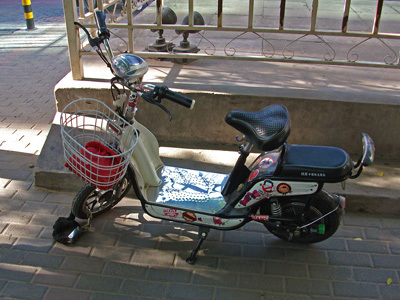 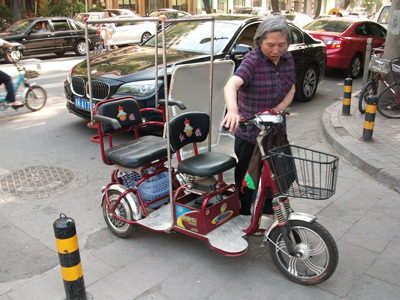 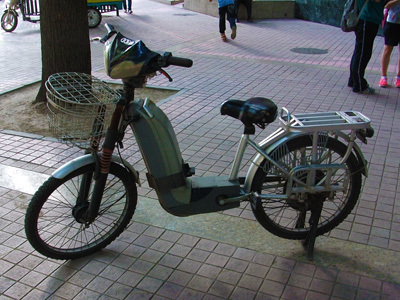 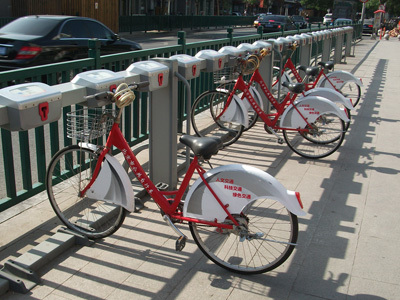 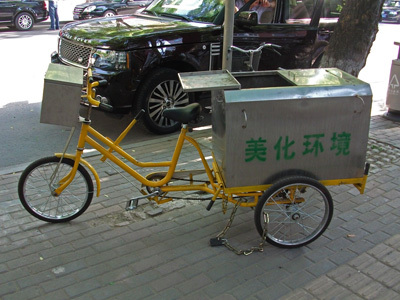 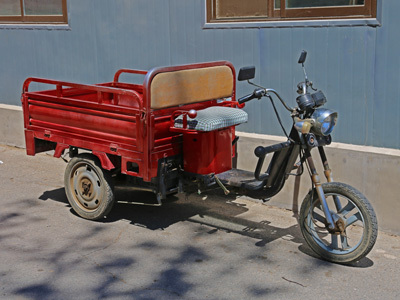 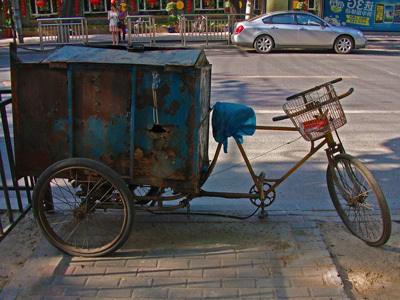 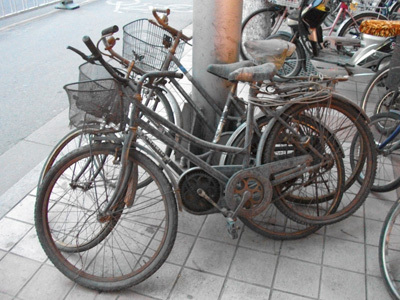 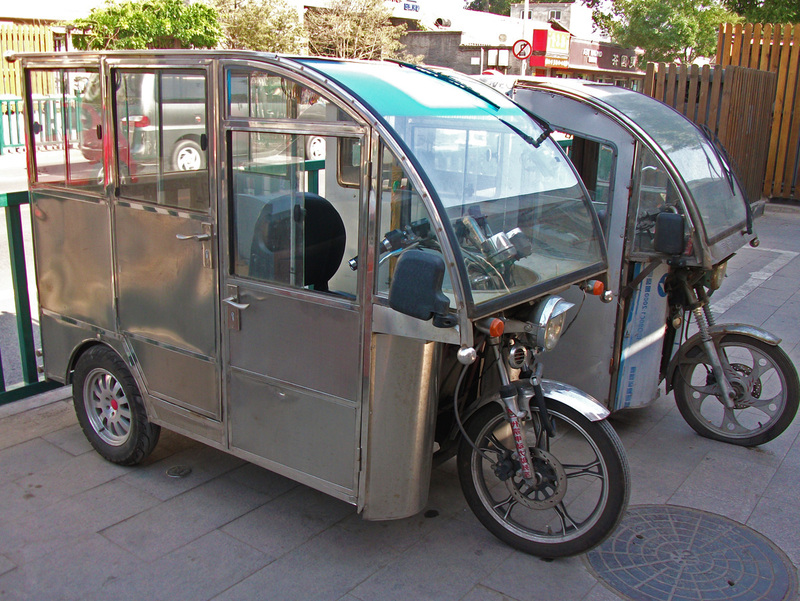 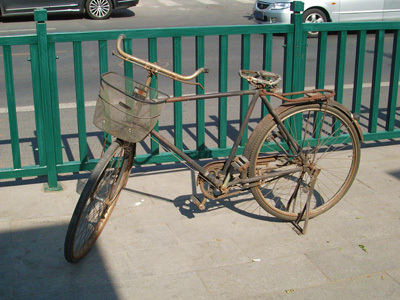 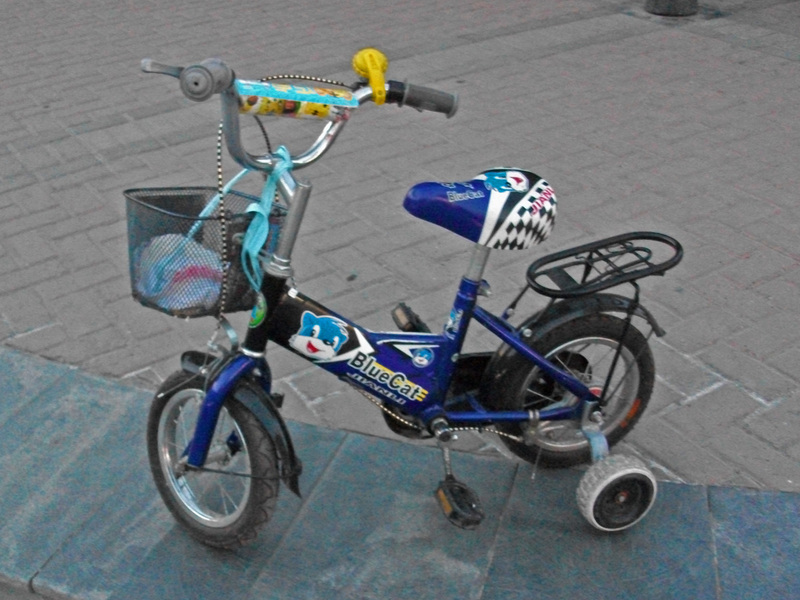 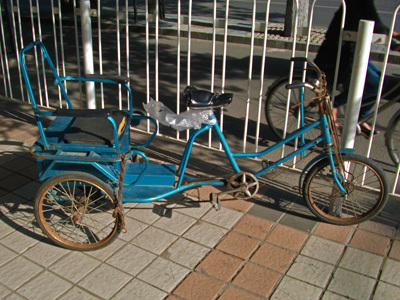 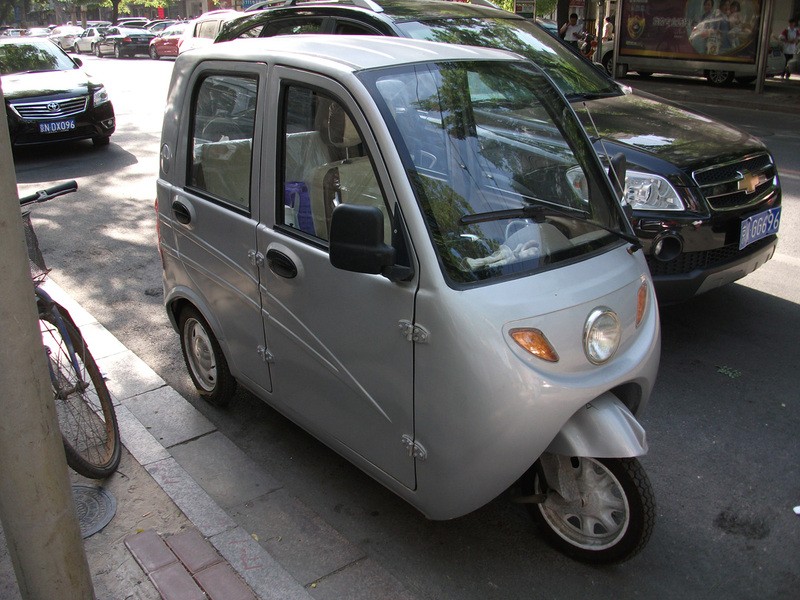 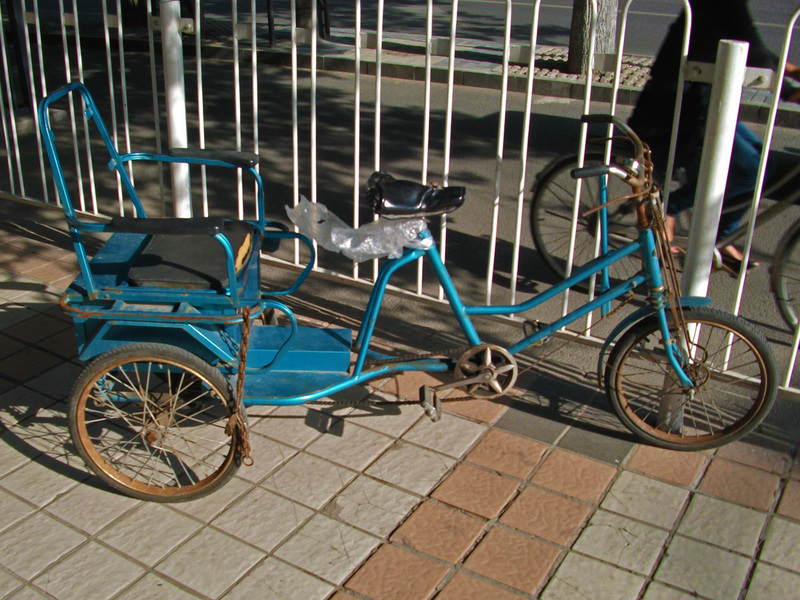 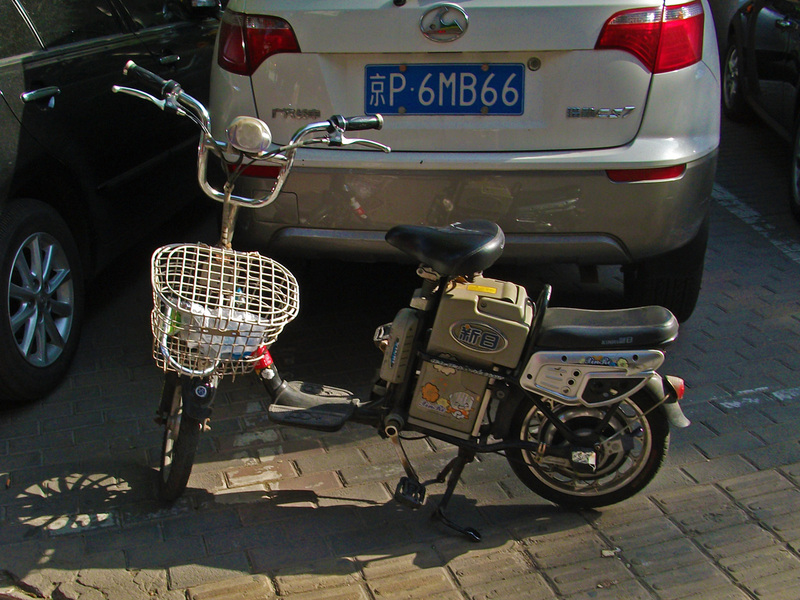 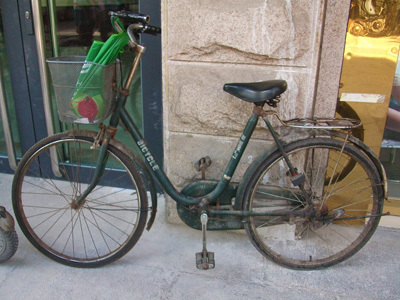 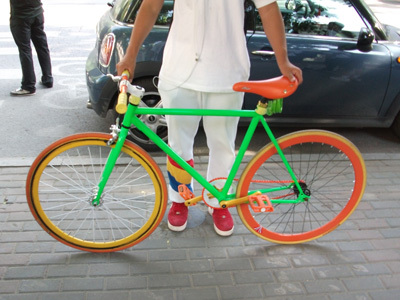 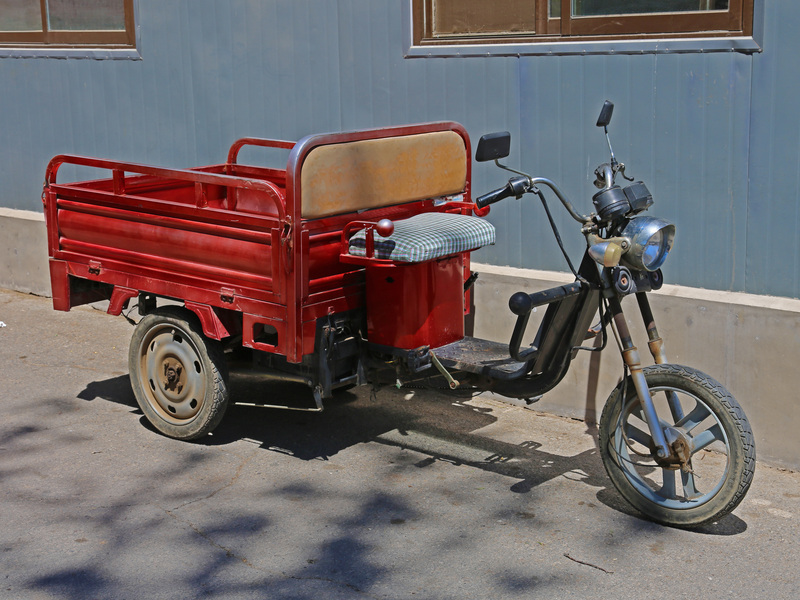 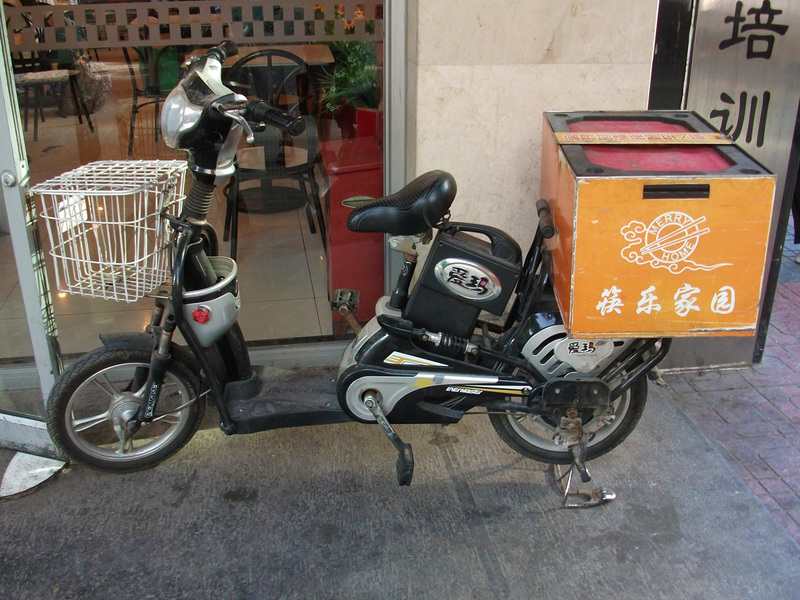 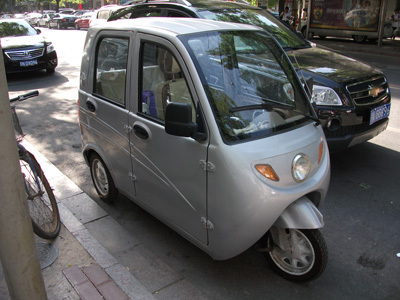 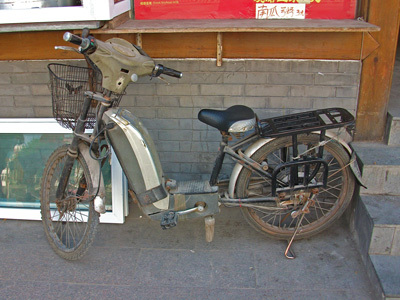 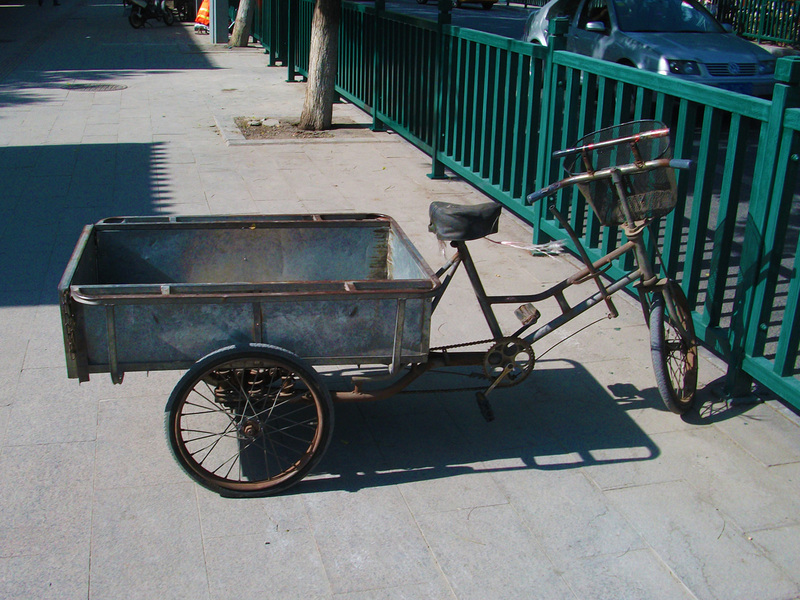 If you have your own images of two or three wheeled transport in Beijing please submit them for entry here, they will be listed along with credits.